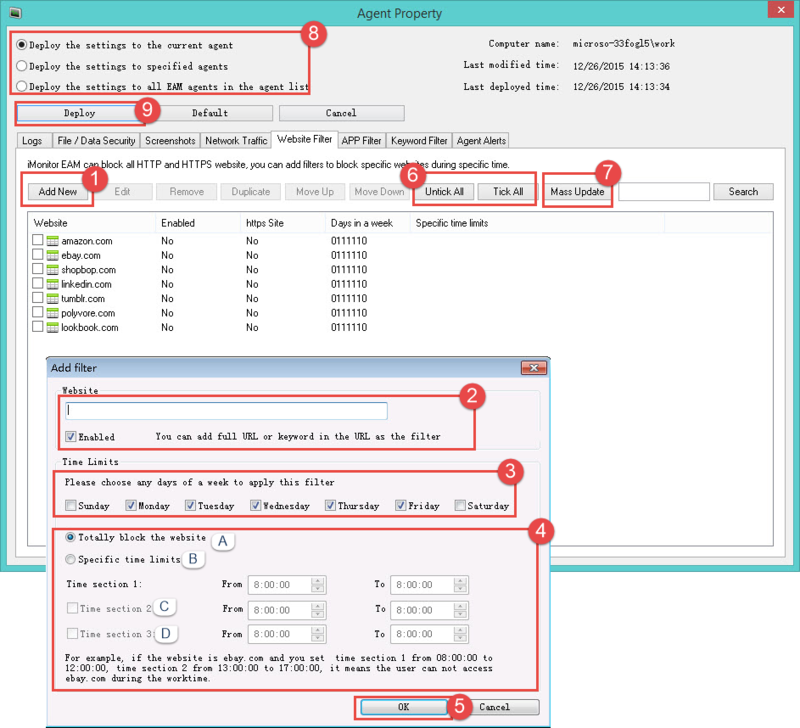 Click the "Agent Settings" on the "Settings" menu to start the Agent Property Setting. 1. Click the "Add New" button. 2. Input the full URL or keyword in URL as the filter and tick the "Enabled" check box. 3. Select any days of a week to apply this filter. For example, if the website is ebay.com and you set section one from 08:00 to 12:00, time section 2 from 14:00 to 17:00, then employees can not access ebay.com during work time. 6. Click the "Tick All" or "Untick All" button. 7. Click the "Mass Update" Mass update will update all column except the first column. 8. Deploy the settings: Tick each deploy rule to deploy the settings. 9. Click the "Deploy" button to finish the deployment.